In a digitally spectacular fantasy world, nobody is ever hacked, spied on, manipulated or otherwise used like a tool. In this imaginary world of ideals, there is no need of WikliLeaks to leak the truth. The perfect world of social internet Shangri-La is a place where all people come together to make love, not war. If this world were perfect Germany would not try to tamper with opinions that in turn form the basis for the electoral process. But we don’t live in that world, do we? The only way to tell truth from fiction these days is to pay attention to your senses, your intuition. When the hair stands straight up on the back of your neck in a situation, it’s fairly safe to say you need to pay close attention. And where the Internet is concerned, evil specters now loom around every corner – your worst fears about privacy and personal security are no longer deep sleep nightmares. An interesting specter appeared over this writer’s shoulder on Facebook the other day. And if intuition and experience serve me, this “Facebook specter” may soon be an uncaged demon that affects you all. Bear with me while I share my intuition on since the day of the initial French presidential vote. My position on Marine Le Pen is this. She is a symbol of clear-headedness in a European fantasy turned sanitorium. No, she’s not the perfect politician. There is no such creature. She is the last chance for Europe to awaken from the deep dream the globalists have cast over the continent. The New Democracy is not democracy at all – and half the people know it in their gut. The EU was never about bringing people together, it was organized as a force against first the Soviet Union, and now Russia. The EU is a satrap in unconventional warfare. But this is another story – Marine Le Pen and international meddling in elections is our tale for today. As a quasi-supporter of Le Len, and as an analyst too, it’s only natural for me to write stories comparing her position for France to those of past leaders. So it went, after researching the candidate’s status in Europe now, an easy comparison between her and the late French leader Charles de Gaulle was easy to make. Whether you agree with me or not, Le Pen’s fight today is very much like the career-long battle De Gaulle waged against these same globalists. So “Why Marine Le Pen Really Really Matters” on my personal blog – posted the morning of the elections – was my way of informing people what is at stake. Did I intend the piece for tipping votes to Le Pen? Of course, it’s my opinion that anyone on the fence in that election needs to throw in with the right wing candidate. But what happened next should at least lift your eyebrows, or perhaps astonish you. I’ve been on Facebook, Twitter, G+, and all the social media channels since the platforms began. It has been my job, you see, to advise people on the best uses of these platforms for their personal or business use. It’s fair to say that me and my colleagues helped launch the social media system. We tested, evaluated, supplied feedback via stories, and in some cases consulted directly with the developers of these now iconic media tools. That too is another story, I only mention it so that the reader might understand then tens of thousands of hours I’ve spent working these systems. Now to a mysterious set of coincidences. With the voting booths open in Paris already, the untimeliness of this “glitch” alerted me. You see only days before my colleague Holger Eekhoff and I had hammered out a report for publication about the so-called “German Truth Ministry”, a new system to essentially censor whatever news the Germans don’t want you to see. With all the “Fake News” and electoral tampering frenzy going on, many of us have been alarmed at EU and especially German measures to silence dissent. That said, it’s widely known Angela Merkel’s government and Facebook are set to censor users during the German elections. The “Ministry of Truth” already controls almost all of German media through Bertelsmann and Axel Springer, but social media is a problem – clearly a big problem the Germans don’t mind taking risks solving. So the question you should be asking now is; “So how do the Germans test this new censoring program?” Well, if in fact there is a censoring algorithm or tool for blocking out voices, the French elections would be the perfect testing ground, no? Turning back to Sunday morning, I called on a few colleagues to test to see if they too could add this story to their timelines. Sure enough users from America to Georgia, Russia and Germany had no problem whatsoever. Six or seven more tries by me, and no luck. I could not even share the shares of my colleagues. From my Facebook console I could take no action whatever on this story. Not from my profile, the profile of our company, the page of our news site, not even groups or pages that I’ve been made an admin over. I could, however, share any other post on my personal blog BESIDES the Le Pen one. I hope you are “up” with me now because this gets a lot better. Fast forward to Monday morning and Marine Le Pen having made it to round two of the French presidential elections. Naturally I expected my capability to post this story to be restored two days after the voting. And sure enough there it was, posted easy as pie on my timeline! “Magic”, I thought. “They used me as a test dummy”, I laughed to myself. But so the reader knows, I live in Germany, so being a test dummy or censored by Facebook is now legal – get it? If in fact somebody did “switch on” the “Truth” machine, it is completely legal – except for one tiny detail. I’m an American citizen and Facebook is an American company. Yikes! No, our little story is not over. After posting the “banned” story on Facebook I decided to look at some analytics to my blog, and guess what I found? Wait, let me explain just how many times a day me or my team look at traffic to various websites – dozens of times a day – we need to see who is seeing what we write or promote! Moving on, in thousands of experiences scanning Statcounter or other metrics I’ve never seen something called an “Unknown Facebook Bot”. In the screenshot above you can see the “bot” looks more like a bug to me. What’s even more astonishing is the number of times this “bot” hit this exact story from the time of my attempted posting to Facebook, to the point where I was able to post on Monday. There were 68 instances with a multitude of hits in each instance last count. But the “Truth Bot”, if that is what it was, is not the most interesting part of my story. An interesting visitor is. Like I said from the start, this story resides in the realm of digital reality. In other words, there is always a miniscule chance the best proof can be wrong – this is what is called “plausible deniability”. A couple hundred hits by some spy bot on your blog might be cause for alarm. But then we all knew Google and the others were stealing our data and using it on us, right? The CIA and NSA and GCHQ and Stasi (opps they don’t exist anymore, do they?) grabbing all our secrets is not secret anymore. 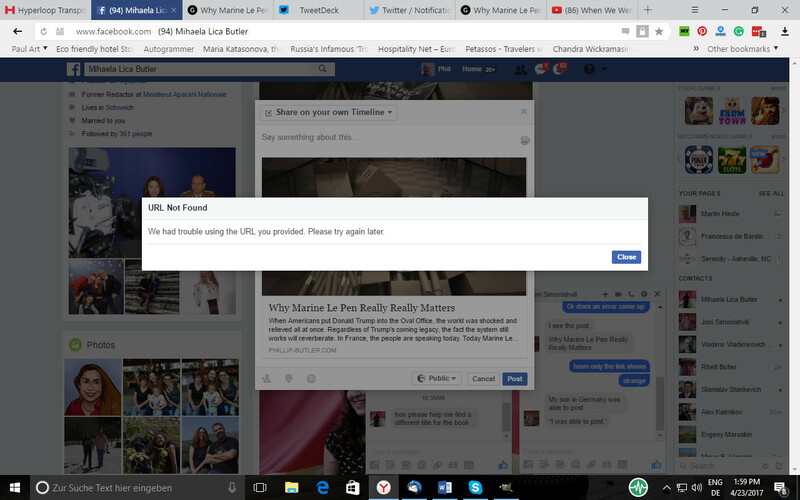 So Facebook and the Germans have this loophole of “minuscule deniability” to help them pry down into our thought processes if they want to. But this “spying on an American” as the perfect social media test rat opens another can of worms. Now the story gets really interesting if you know anything about gadgets. The bot visiting this story on my blog is not really the big story here, I think an individual visitor from Facebook is far more interesting. 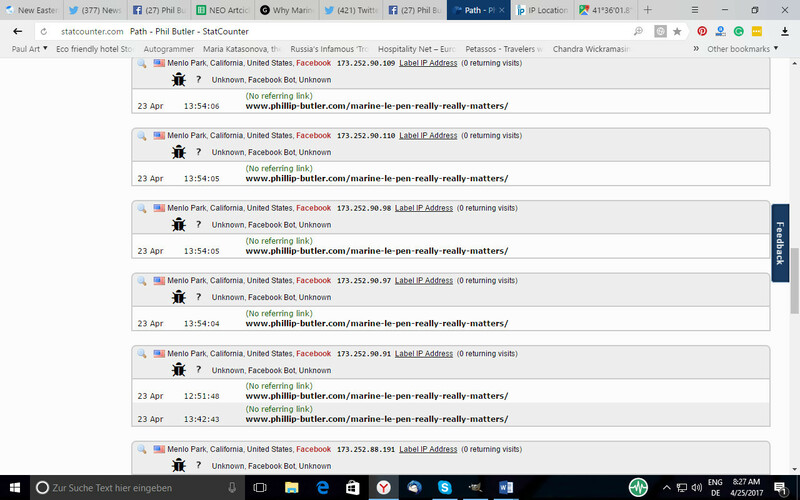 You see Facebook or Google from Mountain View has to index your sites with bots. Only the Facebook or Google bots are easily recognizable and clearly identified. What you don’t usually see are individual devices used by “special” Facebook ips visiting an article. And particularly not using semi-unique devices like obsolete Blackberrys, for instance. Who uses a Blackberry these days anyway? Why even Facebook has dumped the outdated device – all except one prominent Facebook exec I know. I’ve been told Mark Zuckerberg uses a Blackberry as an alarm clock! And we all know stock brokers HAVE to have one of the old gadgets – think Hillary Clinton for crying out loud. Back to our story though, and a summary. A few days before I wrote the Marine Le Pen story, I posted the prologue to my upcoming book about Kremlin trolls. As you can see in the screenshot above, a Facebook person using a Blackberry with a specific IP address first visited that “Troll” story, and then visited the “Marine Le Pen” piece on election day. There’s another individual from Facebook using a Samsung who visits from the same local too, but this person is not as closely identifiable. Now I am assuming this is Mark Zuckerberg checking out my “Kremlin” piece, and then giving the “go” for testing “Truth” on the French election story. I have my reasons, which I shall not get into here. For the reader though, you have to be thinking about the narrowing probabilities here. The coincidences go deeper, I assure you, but there can’t be but a few people at Facebook using Blackberry, and even fewer traceable to Menlo Park and to downtown Manhattan and off Broadway to where Zuckerberg has a mult-million dollar pad. I won’t even get into the sandwich shop I think he has morning coffee at. What’s important is the level of risk, the implication, and the whole election rigging game playing out. Maybe Facebook has their backend servers plugged into a Blackberry stored in a small office above Potbelly Sandwich Shop at 280 Broadway, New York, NY? Then again the flurry of Linux users from Facebook, Amazon in Japan, the UK, and one strange one from France on my site these last days tells me some heavy geeks are playing around. Who uses Linux after all? Maybe I am paranoid after all these years on the web, and after having been named the No.1 Putin Troll! Then again, maybe the “Ministry of Truth” figures they’d best test the most qualified rat to make the German elections totally safe? Fact or fiction? I think the “Truth Ministry” is the precursor to the new Reich Ministry of Public Enlightenment and Propaganda made famous by Paul Joseph Goebbels in the 1930s and 1940s in Germany. As for Facebook censoring or spying on American nationals inside Germany, I’ll have to study on this. Section 230 of the Communications Decency Act (CDA) does confer fairly massive leverage on Facebook, Twitter, and YouTube for censoring individuals. But the PR battle is another story, and so is Germany effectively meddling in the French elections. I am anxious to hear comments on this one.